Struggle. Solidarity. Capitalist governments omit those words in their glossy, superficial receptions on International Women’s Day, March 8. However, those words convey the very essence of this important day for working and oppressed women worldwide. International Women’s Day was founded by European socialists in 1910; they sought to build global solidarity among women and promote their struggles for equal rights. It has also been marked by marches, rallies and sit-ins against war, occupations, political repression, corporate globalization and more. For more than a century, women have marched for jobs, livable wages, humane working conditions and unionization. Migrant workers decry abusive treatment and racism. Women from oppressed and Indigenous nations demand their rights. Women worldwide call for a halt to all forms of gender discrimination and anti-woman violence. A United Nations analysis issued on March 9 revealed a stunning global statistic: One of every three women has experienced domestic and/or sexual abuse or harassment. If that study included violence against women caused by imperialist wars and occupying armies, repressive governments and their police or corporate exploiters, the figures would be much, much higher. Below are some of this year’s highlights. Palestinian women’s determination and strength are lauded worldwide. On March 7, 1,000 of these courageous women marched to Qalandiya checkpoint, which separates Jerusalem and Ramallah. They protested Israel’s brutal occupation of their lands on the West Bank and the siege of Gaza. Freeing their imprisoned sisters was another demand. Some 500 Palestinians and Jewish supporters marched to meet them from the Israeli side. But Israeli soldiers blocked the two groups from uniting. As women neared the gates, some trying to hang Palestinian flags, soldiers violently attacked them, firing rubber bullets, tear gas and stun grenades. Thirty women were injured, 10 hospitalized. As Israel confiscates more land in East Jerusalem and the West Bank, our sisters will keep on resisting. They deserve world support. In Istanbul and other cities in Turkey, women protested gender inequality, domestic abuse, sexual assaults and the rising rate of femicide. Activists denounced President Recep Tayyip Erdogan, who has publicly stated that women are not equals of men. Women say the government’s anti-woman policies are causing erosion of their rights, growing inequities and disregard of violence against women. Bangladeshi garment workers, labor activists and other women rallied in Dhaka on Women’s Day for comprehensive equal rights, equitable wages, safer working conditions and legal protections from sexist violence. Nearly two years ago, the world watched in horror when 1,135 garment workers were killed and 2,500 injured in the Rana Plaza building collapse. To date, 5,000 disabled workers or relatives of the deceased have received merely 40 percent of compensation due them by super-rich global brands. The struggle goes on. 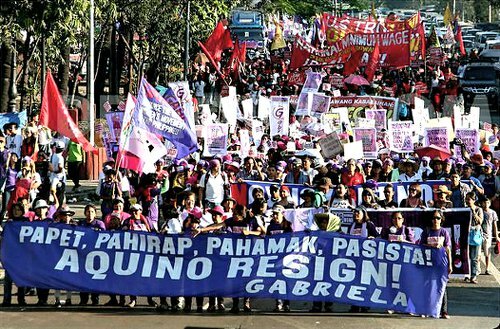 Gabriela, the Philippines’ mass women’s organization, coordinated demonstrations in Manila and countrywide to demand that President Benigno Aquino III resign. They want an end to his pro-U.S., pro-corporate policies, and call for economic relief for one-fourth of the population who are impoverished. Moreover, activists object to growing U.S. intervention, which brings more soldiers, leading to increased sexual exploitation of women. Promoting the rights of the 300,000 women migrant workers in Hong Kong was the focus of the Women’s Day demonstrations there. Indonesian women in Jakarta marched for legal protections and livable wages for the country’s 2.5 million domestic workers, often abused and unpaid. On the African continent, many commemorations took place. In the Northwest, Saharawi women demonstrated against global companies that aid Morocco’s 40-year occupation of their homeland and plunder of their resources in the Western Sahara. In the South, an event in Zimbabwe highlighted governmental measures designed to advance gender equality and women’s rights and to make up for past inequities. Constitutional amendments in 2013 were intended to help achieve these goals in education, employment and participation in government. “Women, strengthening our leadership to change our lives” was the theme of an International Women’s Day meeting organized by women in Canaan, Haiti — a city largely inhabited by people displaced by the 2010 earthquake. “We want to organize ourselves to tell Haitian authorities that we are entitled to basic services. We cannot accept the marginalization which is inflicted upon us in Canaan,” stressed Erlande Brutus, representative of the city’s women’s groups. Saniece Little Phat, coordinator of Solidarite Fanm Lakay, explained Haiti’s unique women’s movement. Geralda Sainville, a leader of Group for Repatriates and Refugees (GARR), encouraged women’s participation to strengthen their leadership, which “is the first step in being heard.” They emphasized building solidarity, too. Socialist Cuba is a beacon of progress for women. 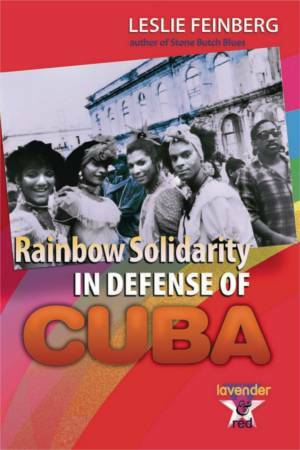 The Federation of Cuban Women, founded in 1960 by Vilma Espin, has been instrumental in this process. International Women’s Day is observed everywhere. The Revolution’s achievements are profound. Notably, Cuba ranks fourth in the world in the number of women parliamentarians with 48.9 percent and second in the Americas to Bolivia with 53.1 percent. 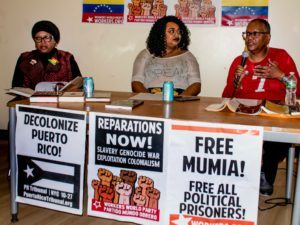 In Tegucigalpa, women rallied for Gladys Lanza, coordinator of the Honduran Women’s Committee for Peace “Visitacion Padilla,” and an anti-imperialist and former union leader. Juan Orlando Hernandez’s U.S.-backed coup government wrongly prosecuted her for slander for defending a woman whom a government ally sexually harassed. Women’s and human rights’ organizations and the popular resistance say, “Drop the charges!” against Lanza, 73, who faces imprisonment, reported Lucy Pagoada, of Honduras Resistance USA. Despite heightened U.S. sanctions and coup threats, the Bolivarian government keeps advancing women’s roles. International Women’s Day was the final day of an 8,000-strong National Women’s Congress in Caracas. Women’s defense of the revolutionary process was highlighted. Rural and urban workers, mothers, youth, militia members and Indigenous women attended; they agreed on proposals to further empower women. The National Women’s Union was founded, which President Nicolás Maduro told participants would have its own “structures” throughout society. He agreed on initiatives for women’s progress, including that they comprise half of the National Assembly. Already, women receive six months’ paid maternity leave, free health care and food subsidies. Mothers are eligible for full rent coverage and are protected from eviction. European demonstrators deplored austerity layoffs and service cuts imposed by capitalist bankers and their own governments. Women marched for equal rights, political representation, jobs, pay equity, reproductive justice and an end to anti-woman assaults. Australia’s actions opposed domestic violence, too. Women’s oppression is rooted in unequal class society. Corporate globalization, imperialist exploitation and oppression of nationalities further affect women. 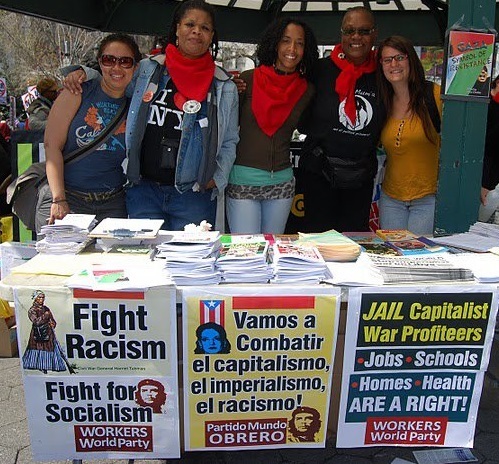 It is time to intensify the struggle against horrific capitalism — in the spirit of International Women’s Day, as its socialist founders intended.